Discover our full-service ski center offering rentals and lessons in addition to a great selection of new equipment. Our ski school is PSIA certified and our Ski Shop staff will be more than happy to help you get set-up with everything you need for a great day out on our trails. 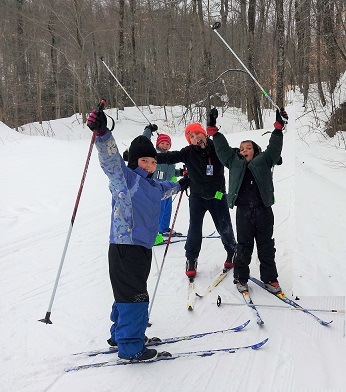 Cross country ski lessons are a great step toward improving your technique and increasing your enjoyment of the sport. At Garnet Hill Nordic Center we teach all ages and abilities including beginner lessons, telemark and ski skating lessons. 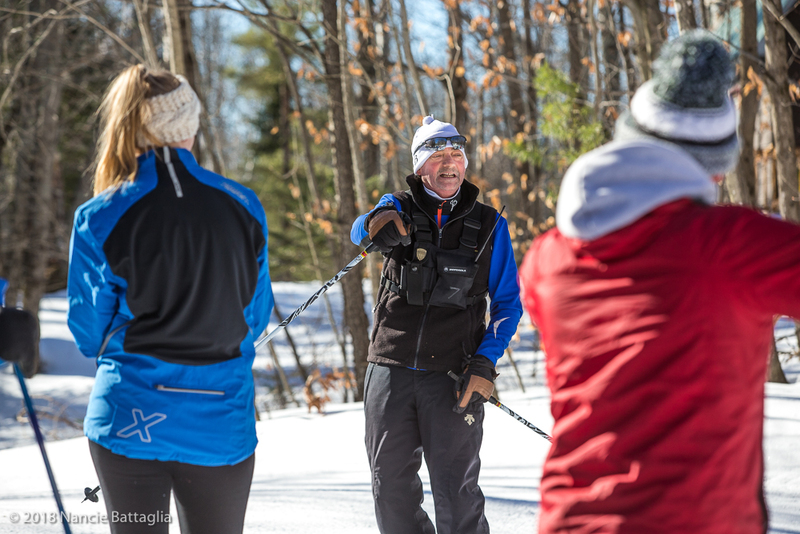 We recommend a beginner group lesson for all first time cross country skiers. The ski school also provides intermediate and advanced lessons including ski skating, telemark and backcountry techniques, and racing techniques. We have a ski school staff that is dedicated to helping you start off on the right foot, improve your skiing, and help you to have more fun on skis. We offer a full range of lessons, from beginner through advanced, including all types of nordic skiing. Your satisfaction is guaranteed! It’s been proven by athletes that the best way to master a new sport is by learning it right the first time. If you develop good habits from the start, it will save you a lot of “unlearning” later, and will allow you to progress more rapidly to higher levels. Beginner lessons are offered as group, semi-private, or private lessons. Intermediate lessons and specialty lessons, such as skate skiing and telemark lessons, are available as semi-private or private lessons. Private and semi-private lessons can be tailored to your needs, and can include lots of focus in one area (i.e. downhill), or can be a “trail” lesson, where we ski the trails, using the terrain to practice different skills. Beginner lessons are for those who have never skied at all, for those who have downhill skied but never cross-country skied, or for those who have skied some, but know they could use instruction on the basics and develop good habits. In the advanced lesson, we get down to the nitty gritty of energy efficiency and improved balance and dynamics. This lesson is for the serious skier who wants to refine his/her techniques and strive for a new level of speed, comfort, and efficiency. The instructor makes a detailed and critical analysis of the skier and gives necessary feedback. Specific skills are addressed as needed, and include all aspects of diagonal stride, double pole, and downhill technique. If you want to learn or are frustrated with your attempts at it, a lesson is highly recommended! There is a lot involved in this technique that looks so easy when you see the experts fly by you. We introduce many different drills to help you improve each aspect of the technique. This lesson introduces the basic telemark turn, and can be done with most regular nordic equipment, although waxable skis are highly recommended. We spend most of the lesson without poles, going through a gradual progression and a series of exercises that results in a complete telemark turn. Proper body position is stressed. If time permits, we try to link turns. Equipment, terrain, and snow conditions are discussed. Individual issues are addressed. Everyone from beginners on up are welcome to join us on our guided snowshoe tours during the weekends. These tours, as well as snowshoe rentals, are free for guests but available to all. See more information.